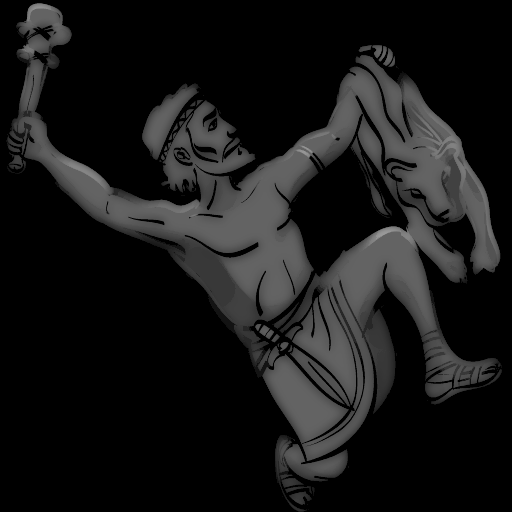 Orion was the son of Poseidon and became a famed hunter who boasted no creature could kill him. Hera, not appreciating his arrogance, sent a scorpion to sting Orion. The scorpion fatally stung Orion and was honoured by being placed in the night sky. Orion and Scorpius were placed on opposite sides of the sky; the two enemies are never seen in the night sky at the same time. Some say that Orion was saved by Asclepius, the God of Medicine, represented by the constellation Ophiuchus. Because Ophiuchus is directly above Scorpius, it appears as though Asclepius is triumphantly crushing the scorpion as they set in the west. At the same time, Orion rises in the east seemingly rejuvenated. In another legend, Artemis, the Goddess of the Moon, fell in love with Orion and neglected her duties of lighting the night sky. The gods reminded her of her duties, but when she still would not fulfill her obligation, her brother Apollo challenged his sister to strike down a distant object that he knew was Orion. Artemis struck down the shape and later realized it was Orion she had killed. In his honour, she placed him in the night sky with his hunting dogs, Canis Major and Canis Minor.